It’s that time of year again, when high school and college seniors walk up the aisle and receive their graduation diploma. Among those making the graduation list this May and June are several family members and a friend. Since this special day doesn’t come around every year, I couldn’t bring myself to buy a commercial card. Instead, I decided to adapt the layout of a spring card I made in a recent Archivers class called Painted Petals. 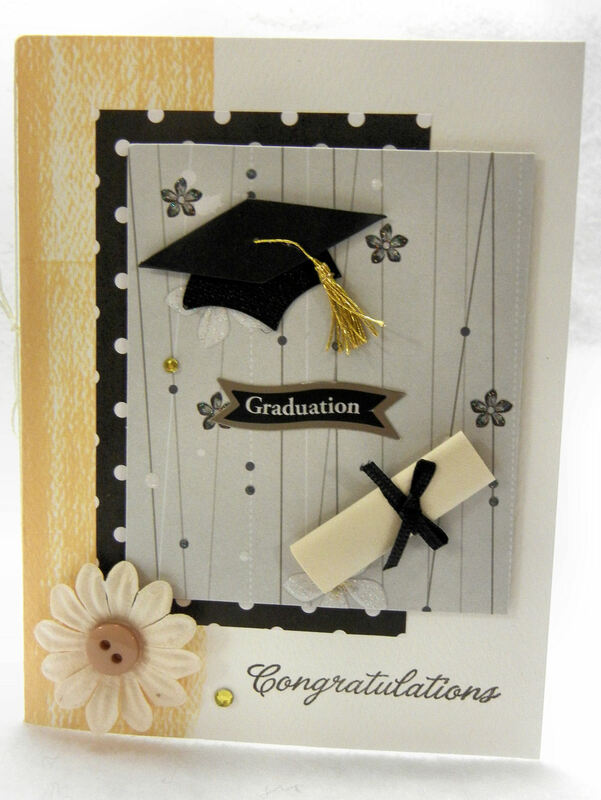 I used graduation-themed dimensional stickers from Jolee’s Boutique, self-adhesive gems from Bazzill Basics, paper art flowers from Hero Arts, and card stock from Best Creation and Boxer Scrapbooks. After I was finished, I needed an envelope big enough to contain the dimensional card without crushing it. To do the job, I used my Martha Stewart Scoring Board to make one from white letterhead. I have decided that this is one of my favorite tools, since it facilitates the process of custom envelope-making, allowing me to assemble an envelope in just a few minutes. You cut your paper, score it, fold it and adhere the flaps, and ta-da! it’s finished. You can see the finished card below. The above card accompanied a gift to a graduating friend who is bright and creative. The gift? 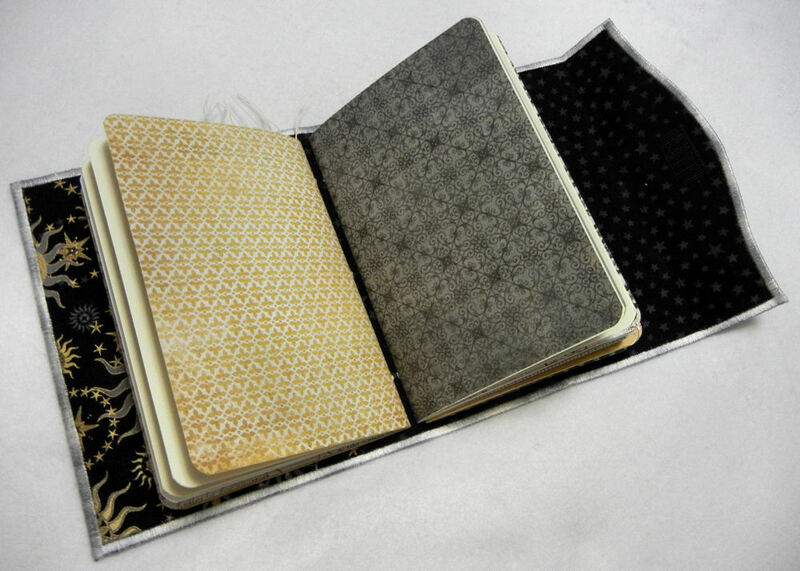 A journal focused on creativity. 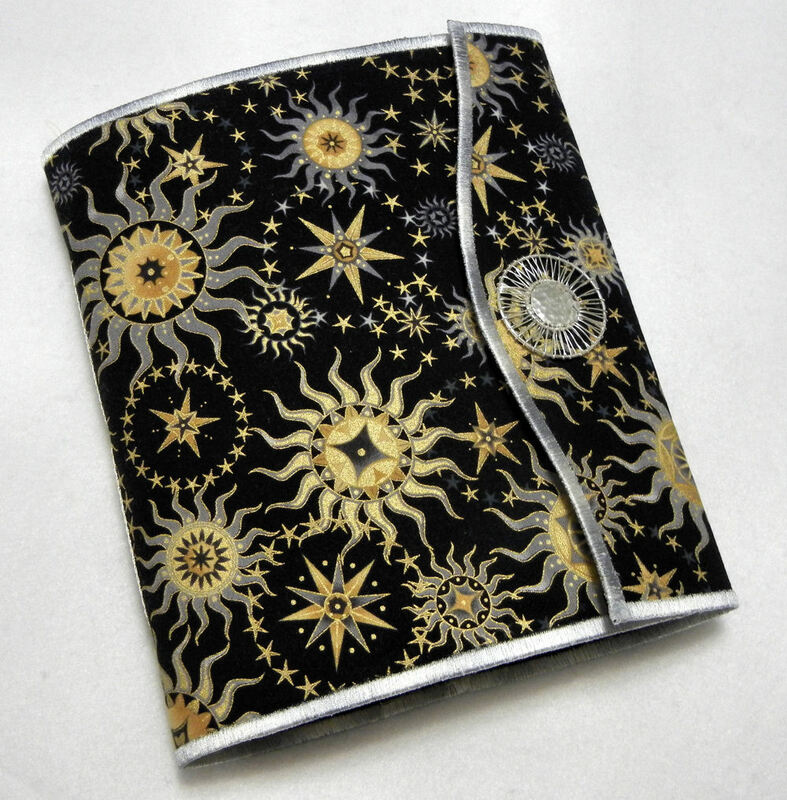 The fabric cover owes its style to Sue Bleiweiss, a fiber artist from whom I took an online journal making class some years ago. 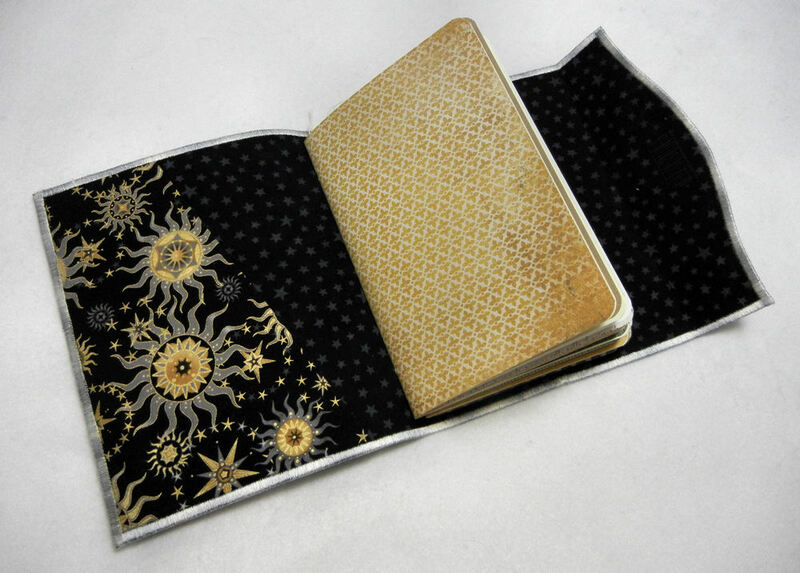 Inside are three hand-sewn signatures, with the last page of each signature containing a surprise pocket. One pocket contains 10 handmade tags, another contains “Creative Play Cards” from Violette Clark (you can get them if you subscribe to her newsletter, Violette’s Creative Juice), and the third pocket contains “100 Ideas” to exercise your creative muscles from Keri Smith, the author of Wreck This Journal, This is Not a Book, and Mess: The Manual of Accidents and Mistakes. If you’ve ever felt creatively stuck, Keri’s books will get you moving again. 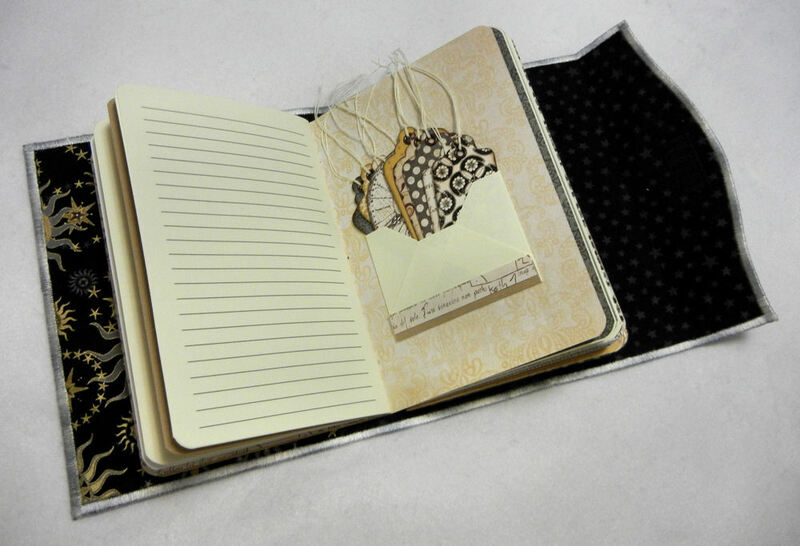 Every time I make one of these journals I like to customize it for the person receiving it as a gift. 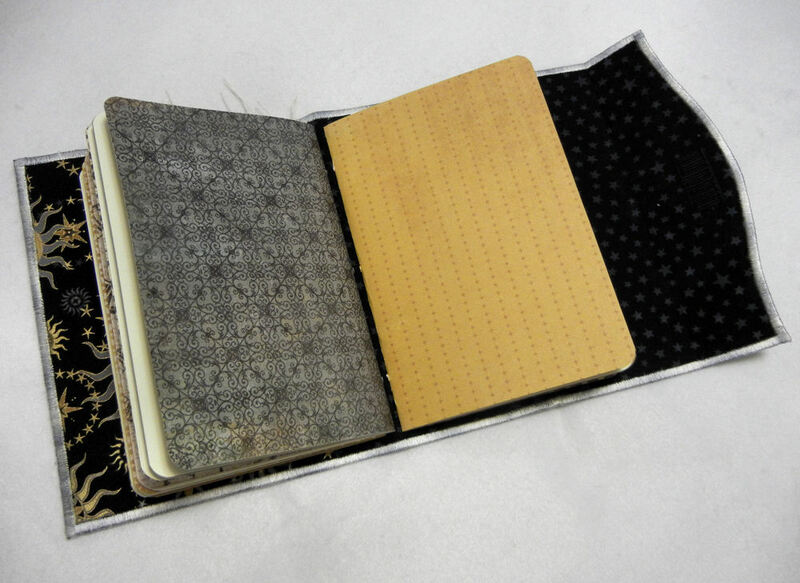 In fact, I often don’t know what will be inside the pockets until I get to that part of the process! 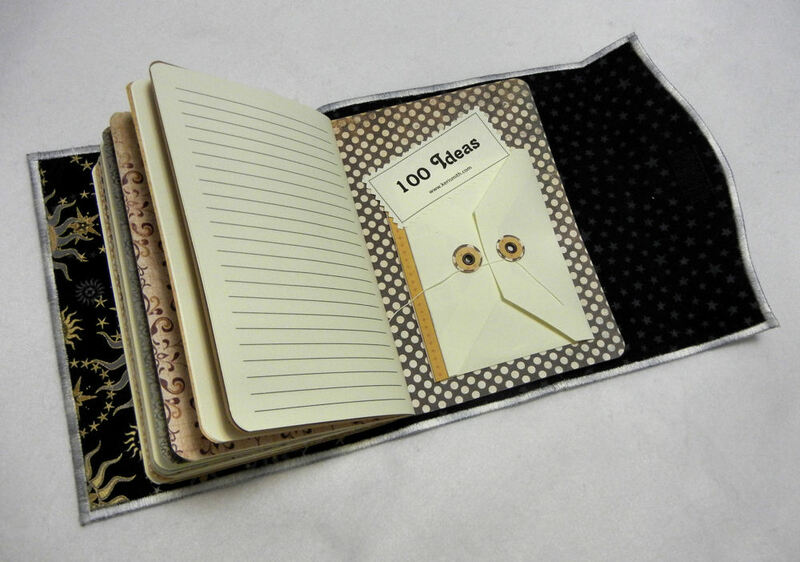 3rd pocket with Keri Smith's "100 Ideas"
Wonderful gift and card! I am sure the graduate will love it! My machine will not do such a beautiful satin stitch…I am in awe. 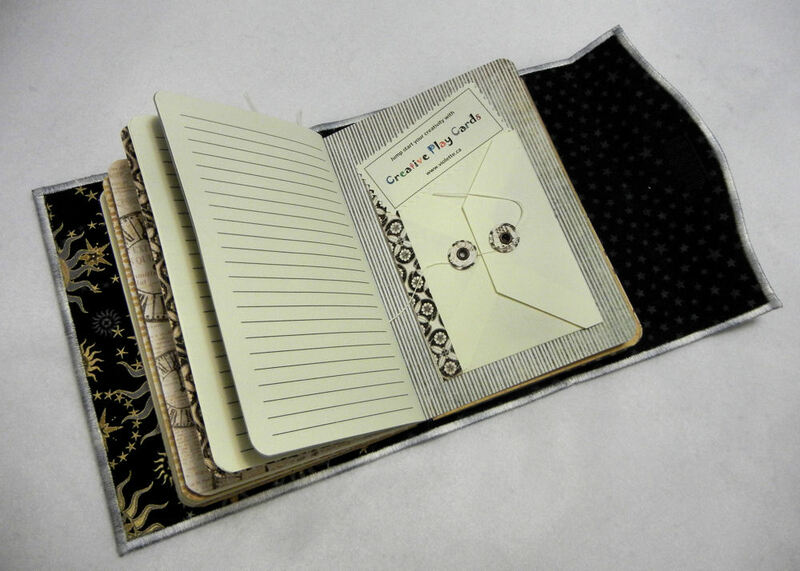 Wonderful journal, I can imagine the graduate will enjoy filling the pages with ideas. So special to have a unique and beautiful keepsake. WOW! this is a really pretty one!!! you know I LOVE it!!!!! that journal making class was so fun, makes me miss you & Liv and our getting ready for it together! !